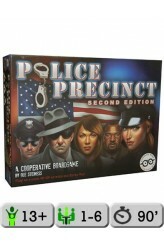 Police Precinct is a cooperative/semi-cooperative game where players are tasked with solving a mysterious murder while simultaneously working to keep crime on the streets under control, and to keep the city from falling into chaos. Players take on the role of police officers with different areas of expertise. The players work together to solve the mystery by collecting evidence and eventually arresting the suspect. Complicating matters is the fact that there may or may not be a corrupt officer that is being paid off by the murderer to suppress evidence, the same evidence everyone else is trying to uncover. Players move around the city searching through randomly shuffled investigation cards for evidence in relation to the murder. The number of investigation cards drawn depends on the cha..